Goodridge flexible brake hoses are available as direct replacements for your original lines (state model and year), as individual parts or made to your patterns or specification . They are usually made while you wait or there is same day dispatch for mail order customers. Part No Working press. I.D. The range shown above is the reusable/self build system which is great for the kit car builder and racer to construct your own lines or replaced damaged parts. Also available is an ever increasing range of crimped assemble fittings. These are available separately but as most people don't have the machine to assemble them we have not listed them here to save confusion. 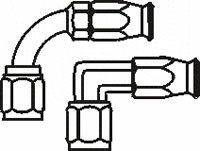 If there is a specific fitting you need for a line but don't see it in the parts above it may be available in the crimp system which we can supply made up onto the line. 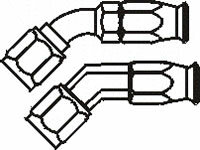 3 WAY CONNECTOR " Tee "